This gourmet frittata is a signature dish at the Mill House Inn, set in the quaint seaside village of East Hampton. Wash lobster carcasses well removing the grain sac (brain) and roe. Additional shells from lobster meat preparation may be added. Heat oil in heavy 6-8 qt. stockpot. Stir in the lobster carcasses and cook until most of the liquid has cooked out. Stir in the carrot, celery, garlic, bay leaf, and thyme. Cook at a moderate heat until softened. Deglaze with wine, then add tomato juice and water. Bring to a boil, then reduce to a very low simmer for approximately three quarters to one hour. Strain stock through a cheesecloth-lined fine sieve; discard solids. Stock will need to be further reduced to intensify flavor and yield 5-6 cups of Lobster Glace. Another three quarters to one hour. Cool glace and refrigerate up to 4 days or freeze up to 3 months. We recommend using a stainless steel saucepot and a very low heat setting. Gently warm oil in a non-stick ovenproof saute pan, add shallots, stir until wilted, add asparagus and roasted pepper. In second pan render bacon. Then add onion with diced potato and parsley and sautŽ until potato is golden; keep warm. Beat eggs with cream, 2 oz. lobster glace, salt, pepper and herbs. Add egg mixture to pan with shallot, peppers and asparagus. Stir well to combine, place in oven preheated to 400¡ bake until set, approx. 10-12 minutes; remove & keep warm. In a small saute pan heat lobster glace and lobster, add butter and stir until butter is fully incorporated. Season to taste. Warm plate in the oven or over the stove. Spoon potatoes on the plate. Place Frittata on top of potatoes. Arrange potato batons and asparagus. 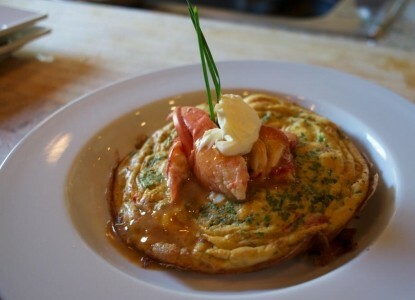 Place lobster on top of frittata. Drizzle Lobster Glace & creme fraiche. Toss chives & Eat Well!